Community Action Agencies (CAAs) that run Head Start programs are tasked with following two sets of different, yet overlapping requirements that apply to the funding they receive under the Community Services Block Grant (CSBG) Act and Head Start Act. 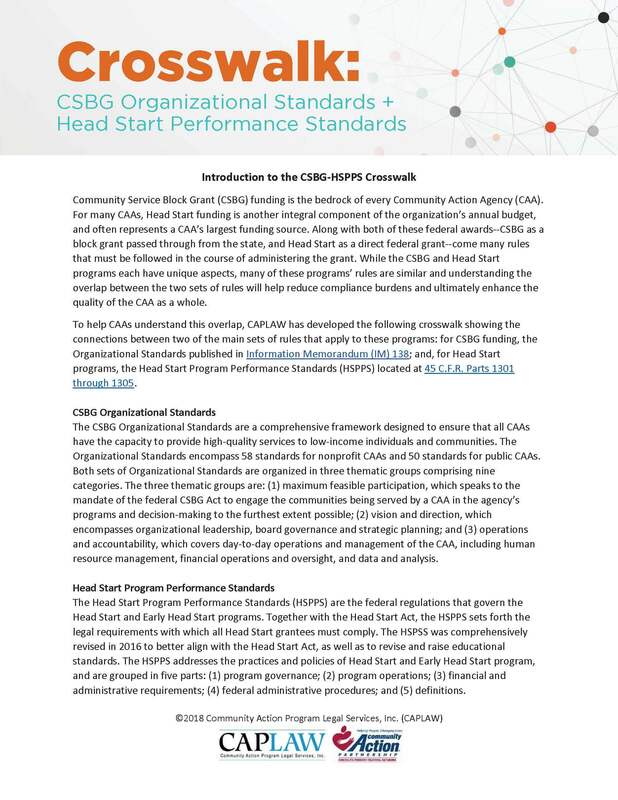 To help CAAs understand this overlap, CAPLAW developed a crosswalk showing the connections between the CSBG Organizational Standards, published in Information Memorandum (IM) 138, and the Head Start Program Performance Standards, located at 45 C.F.R. Parts 1301 through 1305. This crosswalk is intended to be a practical tool for CAAs, highlighting ways that board and staff members can leverage the intersection between the two sets of requirements to demonstrate compliance with the rules of both programs.